I love the sleek, clean look. While readers want attractive pages, the information within is the reason why they are here. This new design highlights that and does not distract. I am a fan already! I think the varied backgrounds will be a good idea. I’d like for you to implement a way for the hubber to choose the background. That way, he or she can match the background more appropriately to the topic they are discussing. For example, if I’m talking about kayaking, I’d like to be able to choose a nature themed background. If you could add a couple of tools for the Hubber to use, such as being able to put the Headlines in colors and being able to chose the type of border that is used around a picture, would be big pluses in my opinion. 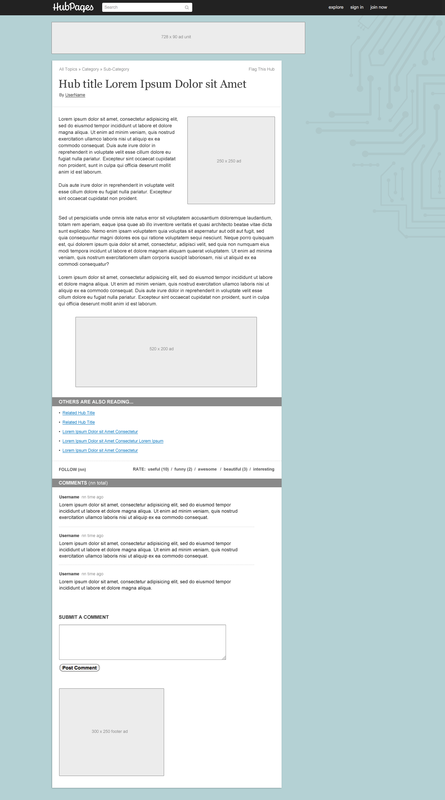 Also, I would like to have the ability for the picture to be two-thirds of the width of the page, so type could go down the side in the narrow column and then return to the full width. Putting a full width picture in the hub, destroys the flow. I use to be a newspaper reporter and designed many front pages over the years. Finally, I wish the capsule titles could be in a Serif Type instead of Sans Serif. Personal preference. Is this something that will only be useable by technology hubs? The reason I ask Simone, is because if you look at a few of my indepth lengthy articles on new religious movements and other topics ( I have created a few that went easily into 5 to 10 page lengths of HTML….I just used the theory of designing them like there were DHTML pages, if ya know what I mean ), I could really have made my life easier if the page load factor had been compressed. I assume that what I am asking will not true based on…. I have always felt that hub pages had a very good design model for its use of HTML design, but was more steamlined like artists prefer, if they have no code understanding. So if my little opinion matters at all, I would encourage you to take this thinking further or at least go with your current ideas. I concur, and see many potential advantages to it…it already has given me some interesting ideas on ways I could tweak it to make even more interesting use of it…am interested in your reply. Simone : If you look at a hub I have that the title starts ” Monarch 2012 : The New…” you can see what I mean by my heavy use of graphics, video, and lengthy scrolled text. The page load sometimes takes a minute, but I don’t care. Still if this new format is becoming a standard, I am sure I will love it. On a personal not SS. Since you have been aboard I have noticed some excellent changes in the HubPages design, efficiency, and response to technical issues. Of course I know that the whole community of admins and staff is responsible, but it is obvious that your input has brought the ole ship back from the Bermuda Triangle. May a thousand Goddesses and All their angels be at your back, and may your high tech mind be enlightened by magick all the time. THIS…looks 100% better than the other layout idea!!! The text of the hub should be the #1 focal point. It is what brought the reader to the hub and why “we hubbers” write here. I like the “What others are reading” at the bottom. The “Author” box with contact information and author hubs should still be in a more prominent location to allow the readers to find more of our work. What are the ideas for the Right sidebar area? Hopefully no overblown pictures. blake4d, we’re testing it on only Technology Hubs for now, but when we settle on a design, it will roll out on ALL Hubs. I agree that faster page load times would be ideal, and can especially see how the faster load times could benefit many of your Hubs. I have nothing to do with these updates, though. I’m just along for the ride, dude! Micki has been heading up the project, Fawntia has done a brilliant job executing the rollout, and my buddy Amy Liu is being as brilliant as ever with making things purdy. SimeyC, this design should go live sometime today. YAY!! I like how you got rid of the HubScore. I don’t like it when people who know nothing about HubPages have to see the score. Especially, if the score is low right after publishing it. Perhaps, some features can be shown for people who are logged into HubPages and some features can be hidden from those who are not. This way search traffic doesn’t have to see all of our “HubPage Stuff”. I do not like this at all. The gap is way too big and empty so is distracting. Only one lot of ads is not going to make us much money either. And I can not find the share buttons for Twitter etc or so we can share other hubbers hubs with our followers. Well this change certainly does effect some of my hubs and one of my “top” hubs. I certainly hope it does not decrease my views and stats too much! I am a poor hubber and need the views, lol. Overall, the design looks great. This looks cool but why can’t I see the ads at the top? Also do we have the option to use the old layout? I switched off the Hubpages Ad Program. Using this layout, I can only see 1 Google Ad unit and 1 link unit (below) Why is that? Ads at the top and at the side disappeared. All of the above sub topics are having the Circuit Board Background. This doesn’t looks good with all the Hubs under this Topic. Also please work on the Revenue side. Love the new look and, more importantly, your method of getting there: usability design principles applied correctly. Bravo! I can’t wait to see it. I like the design. Very on trend as I have said elsewhere. It has a nice engineering feel to it and the colour is spot on. Washed out pastels are on trend too. It is not fussy, which from a tech point of view makes sense. Readers have come for technical information plain and simple. I think it works. Good work guys and gals. I feel the “circuit board” background is not appropriate for all Technology Hubs. It implies an electronics-related subject, whereas Hubs about making money online are more likely to be about writing, promoting or designing rather than anything remotely machine-related. Looks great, reminds me of the fashion hubs. I like the fact that there is very little distractions, kind of focuses on the article. Good work. I do like the cleaner look. Please add the sharing buttons back, though. Especially for us to share with our own followers but even twitter, FB and Stumbleupon? I haven’t tried the suggested reading links you added, yet. If they don’t open in a new window, please add that feature so that the readers don’t get lost after they click. Yep. Just tested it. On the portion that says “Others Are Also Reading” (which looks REALLY nice, BTW) please make the links “open in a new window” or give us access to add the html code ourselves? best thing to rember hub is an important part.